The addition of the new fire pit at the Gale River Motel has resulted in an unexpected consequence. “The fire pit provides a social setting for individuals and groups to gather around and socialize with each other that they otherwise wouldn’t enjoy” reports Kevin. 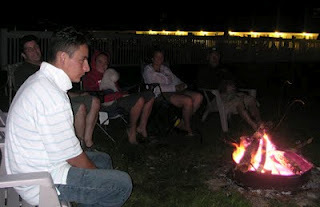 A large family from Honduras was staying in one of our cottages and another large family had rented out several rooms, the evening campfire provided a wonderful setting for the two groups to meet and socialize while toasting smores and enjoying the blazing fire. The firepit has been popular during the summer despite the overcast skies. Couples have enjoyed quiet intimate conversation in front of the flames as much as the families with little ones roasting their marshmallows. Consistent with the Gale River Motel’s eco-friendly philosophy, all of the wood being burnt is deadfall that has been cleared off the property, or material scavenged from the area’s recycling center that was destined to be burnt by the town. The fire pit will be continued through the winter months so that visitors during the colder season can still enjoy the pleasure of a bonfire.